I have been working with Linux since around 1992, both at home and at work. I have probably seen it all with exception of item in the title. 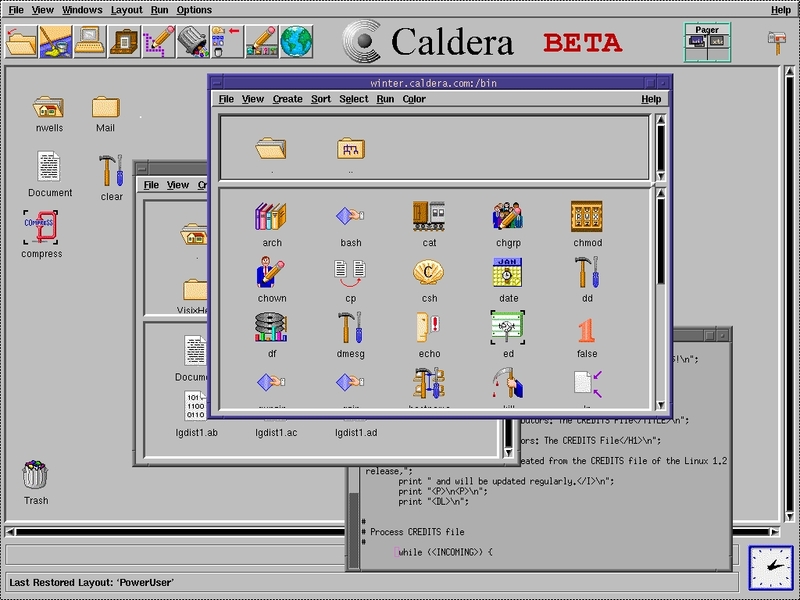 Lurking around my files, there was a screenshot of a beta version of Caldera Linux. As time passed I somehow never managed to see it with my own eyes so for me it’s features were always covered by myths and legends. Recently I came across install media for the OS and decided to to see how was it like for real. The system installed just fine through series of tubes^H^H^H err dialog based setup steps which were common at the time. However as I wanted to see the GUI in action there was a problem – 640×480 VGA mode, or rather lack of better video mode to work with. Unfortunately neither VMware nor VirtualBox do not support anything better than the crippled VGA mode. They do it for all other devices, like network card, mouse, ide and atapi cdrom. But somehow not for graphics. Fortunately the other virtualization engines are bit better. 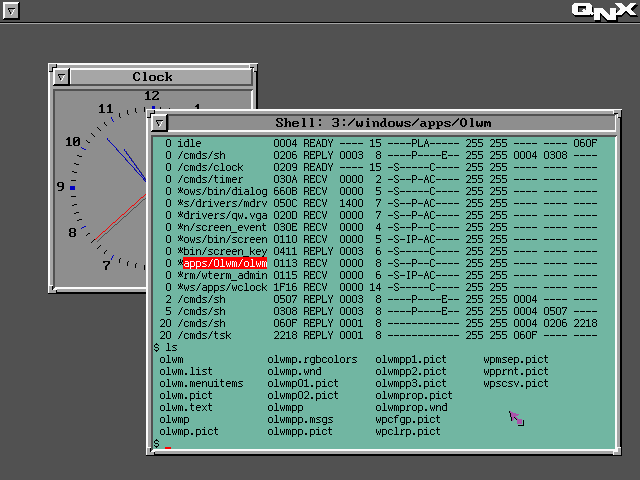 QEMU supports Cirrus Logic and Virtual PC supports S3 Trio. Wait a second, these icons remind me of something! Apparently Visix Looking Glass became Caldera Desktop… I will need to dig in deeper in to this eventually. Apart from that Caldera is loaded with tons of ancient software. Pretty much everything there was available on Linux these days and all working out of the box. Neozeed will be happy to see Neko in action (see the last screenshot)! You can check more memorabilia including physical disks here. Michal Necasek of OS2 Museum has fixed XF86_SVGA so that it works correctly with Virtual Box in higher resolutions as well. “You’ll have to set up the X so that it uses the XF86_SVGA server and tell it to automatically detect the graphics hardware. Then it should be just a question of selecting some sensible monitor and creating a few modes. If things are configured properly, you’ll see something like “SVGA: chipset: boxv” in the X server output.“. Download here. Enter 1988… around that time Microsoft just released MS-DOS 4.01 and IBM shipped OS/2 1.1. 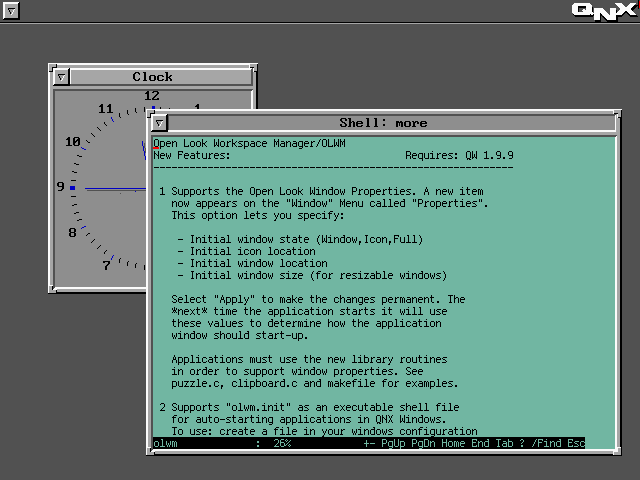 Compare to the other two, this QNX was years ahead of its time. Pretty much on every aspect. 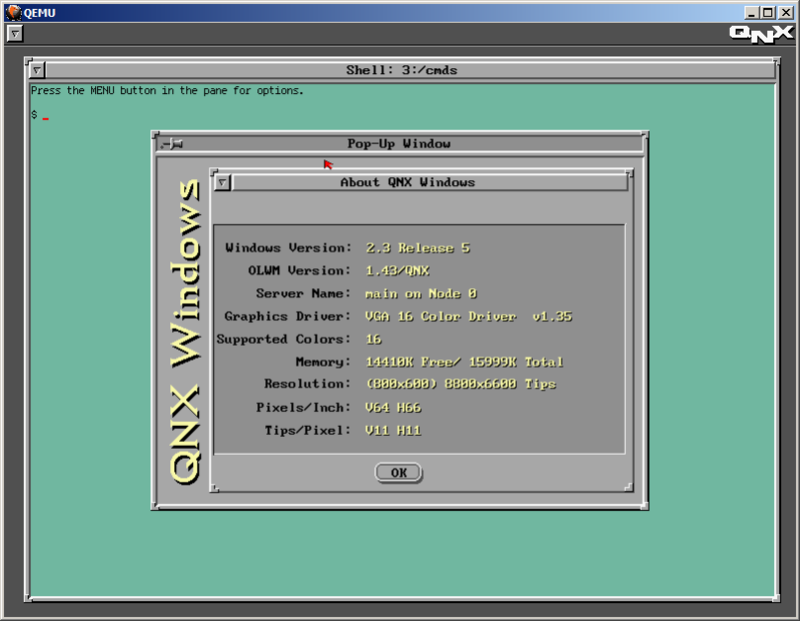 Now, some 25 years later QNX2 is still found running industrial machinery, clean rooms, avionics and military hardware. Some people report systems up and running non-stop for 15 years and longer! It took me similar amount of time to acquire usable media set. QNX is an embedded system and never really seen life on a desktop machine, so finding these floppies was rather hard and expensive adventure. Fortunately I can finally let it see some daylight. Let’s examine how the system will install on a modern hardware under VMware Workstation. The install is rather straight forward. Floppy boot comes with a login prompt. 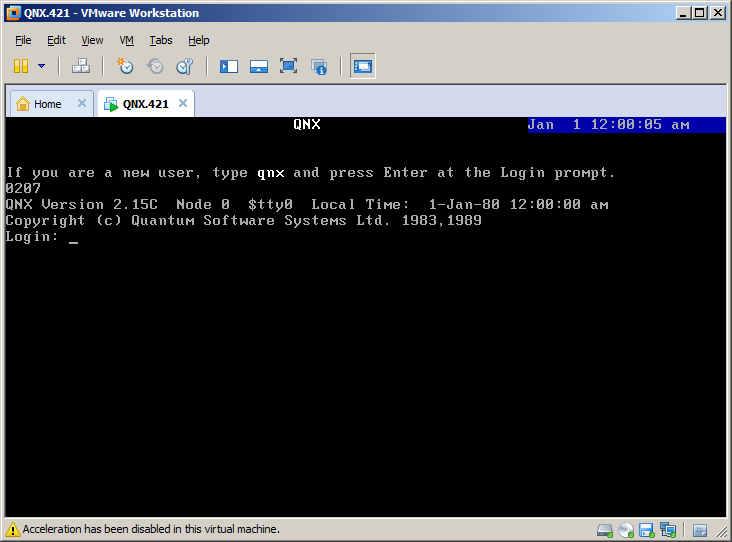 After you log in as qnx you need to swap the floppy disk to Boot Utilities and run install. The script guides you through setup steps. First you need to select the disk controller. For compatibility mode QNX 2 provides access via int 13 (real mode). Then you partition the disk. QNX partition type is either 7, 8 or 9. You will be asked to mark it bootable later on. Then you have to select the kernel. QNX can operate in real mode and protected mode on AT286. The install script copies all the data from distribution floppy disks, asks about boot loader and active partition. Finally you get to choose some video options. The system also asks about networking options. Unfortunately it only works with custom Arcnet cards so I skipped this. Once complete you are asked to remove the boot floppy disk and reboot the machine. This is what comes up after first hard disk boot. I guess what is in the system will be the a topic of another post. 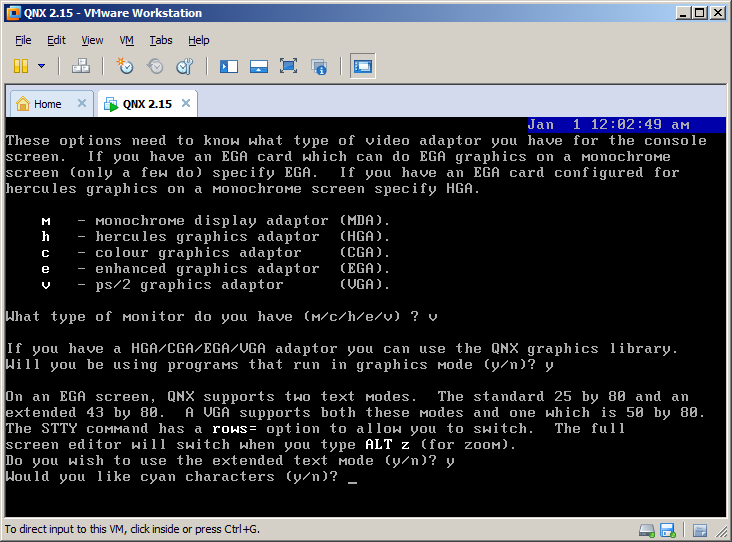 You may also be be interested in QNX Windows and Fun with QNX 4 Networking posts. So this gem popped into my mailbox as everyone over at os2museum was whipped into a frenzy over the apparence of the predecessor to OS/2 making a showing! So what is this, where did it come from? Microsoft started work on a multitasking version of MS-DOS in January 1983. At the time, it was internally called MS-DOS version 3.0. 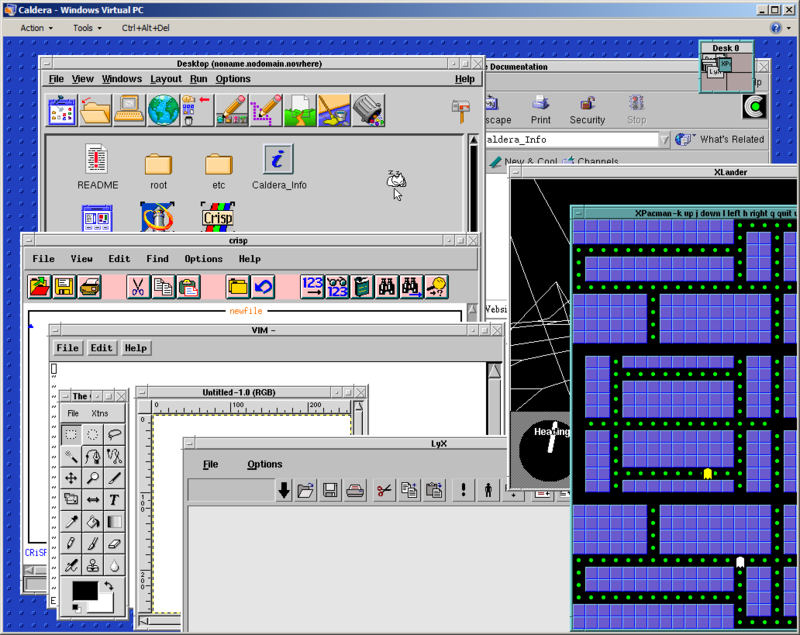 When a new version of the single-tasking MS-DOS was shipped under the name MS-DOS version 3.0, the multitasking version was renamed, internally, to MS-DOS version 4.0. 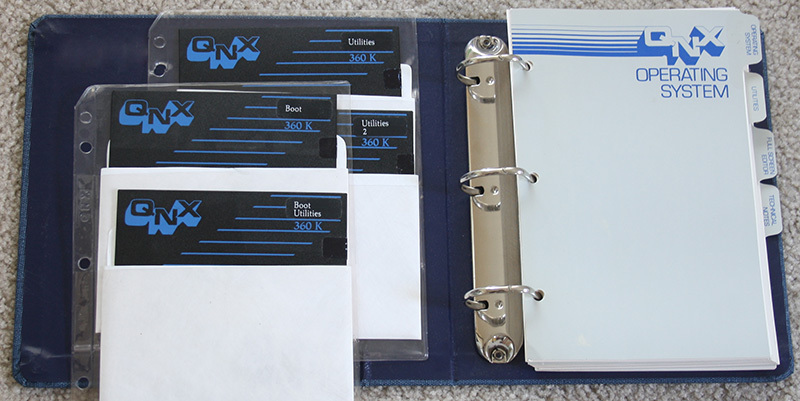 A version of this product–a multitasking, real-mode only MS- DOS–was shipped as MS-DOS version 4.0. Because MS-DOS version 4.0 runs only in real mode, it can run on 8088 and 8086 machines as well as on 80286 machines. 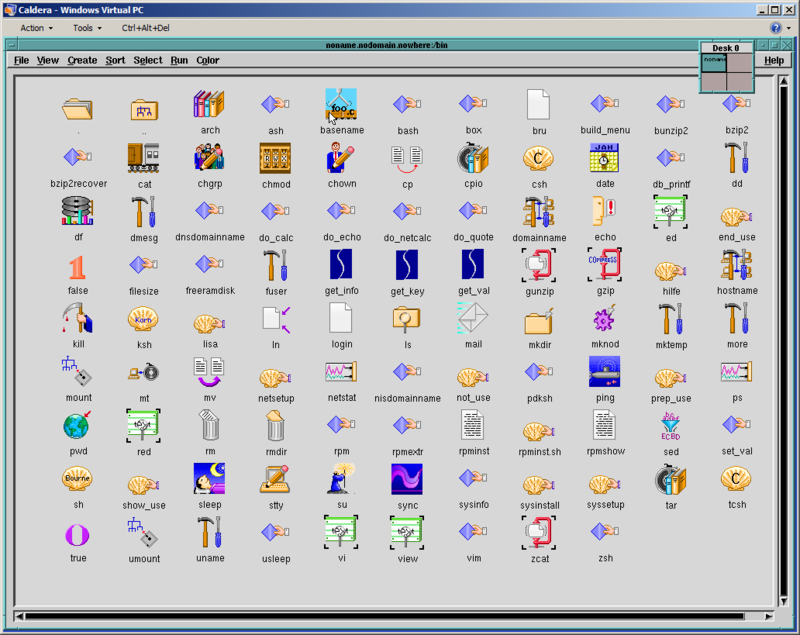 The limitations of the real mode environment make MS-DOS version 4.0 a specialized product. Although MS-DOS version 4.0 supports full preemptive multitasking, system memory is limited to the 640 KB available in real mode, with no swapping. It is not feasible to support general purpose swapping without memory management hardware that is unavailable in 8086 real mode. This means that all processes have to fit into the single 640 KB memory area. Only one MS-DOS version 3.x compatible real mode application can be run; the other processes must be special MS-DOS version 4.0 processes that understand their environment and cooperate with the operating system to coexist peacefully with the single MS-DOS version 3.x real mode application. 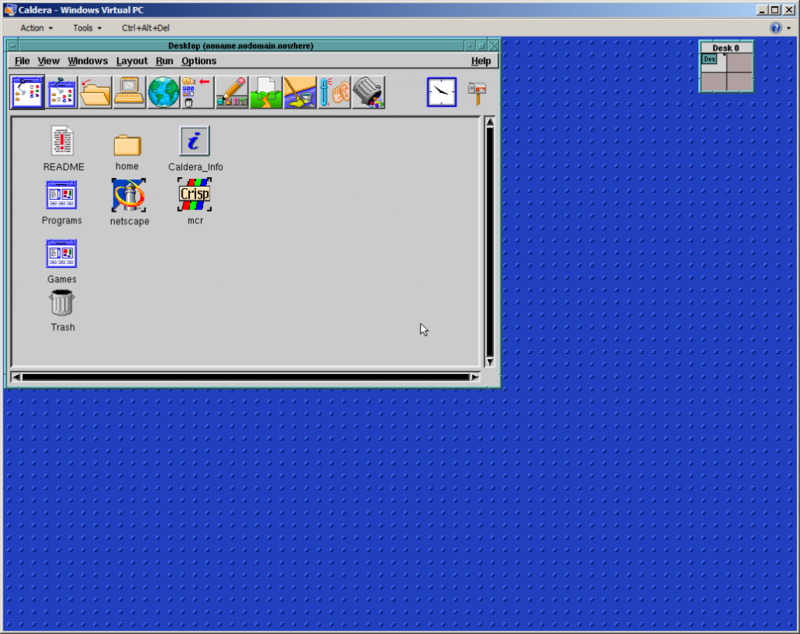 Although MS-DOS version 4.0 was released as a special OEM product, the project–now called MS-DOS version 5.0–continued. 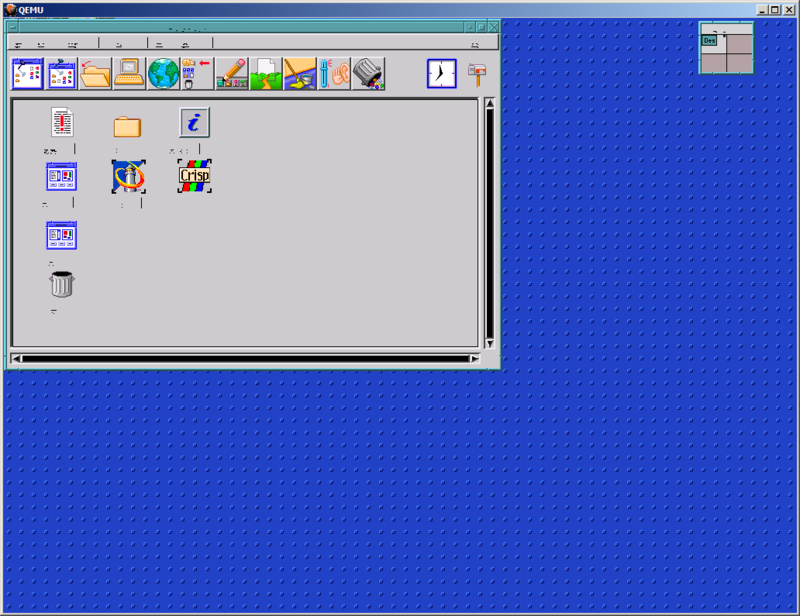 The goal was to take advantage of the protected mode of the 80286 to provide full general purpose multitasking without the limitations–as seen in MS-DOS version 4.0–of a real-mode only environment. Soon, Microsoft and IBM signed a Joint Development Agreement that provided for the design and development of MS-DOS version 5.0 (now called CP/DOS). The agreement is complex, but it basically provides for joint development and then subsequent joint ownership, with both companies holding full rights to the resulting product. As the project neared completion, the marketing staffs looked at CP/DOS, nee DOS 5, nee DOS 4, nee DOS 3, and decided that it needed…you guessed it…a name change. As a result, the remainder of this book will discuss the design and function of an operating system called OS/2. 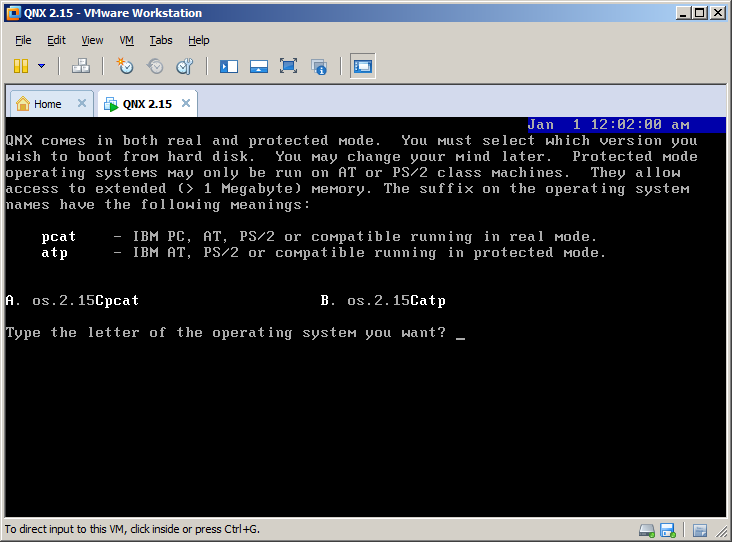 Thanks to Steve Wood’s original memory-allocation design, many of the changes involved bypassing real-mode code that served only to emulate the protected mode of the 286. It would make sense at the time both multitasking DOS, being used for parts of early Windows, as both would be fighting the same problems regarding trying to live in the 640kb dos memory area. While going with a protected mode in OS/2 there would be no need to maintain this, and they could start with a new memory model, Windows 3.0 went with an in house DOS Extender, and fleshed out more of its memory handling to be more 286 native. Its a shame they didn’t go straight to 32bit stuff on the 386, bypassing the 286 but IBM was the proverbial elephant demanding 286 support. 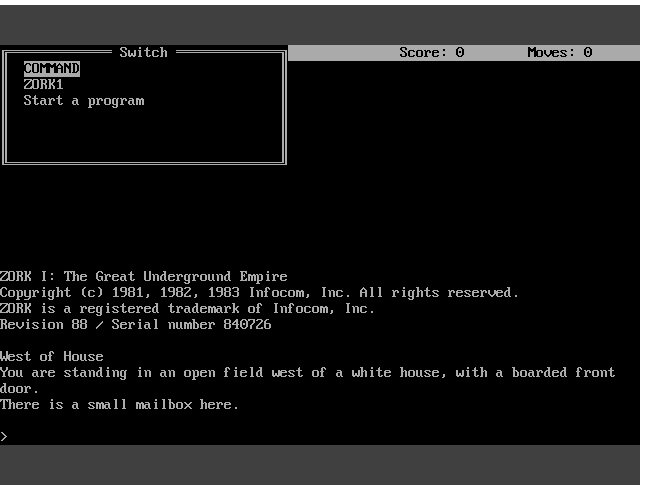 For anyone wanting to try out this ancient OS, I was able to find out that it does run on DOSBox! So that means if you have a java capable machine you can quickly boot it up! The left alt key brings up the task switcher, and you can use the arrow keys to navigate. DOOM runs. I’m really still amazed at this, but it does crash on exit. I think it was more so geared to small text mode stuff, much like what Windows 1.x or 2.x is capable of on a 286. I’m still a bit amazed the disks still work! A nice, if not long teardown video, showing some of the mechanical problems with old Commodore kit, where connectors aren’t well connected to the PCB all too well. I’ve only seen this pop up on G+, but I thought I’d pass it along. Author neozeedPosted on March 14, 2013 September 14, 2017 Categories AmigaLeave a comment on EEVblog Vintage Teardown Tuesday, the Commodore Amiga 500! I found this out on the forum bannister.org. I have no idea if it runs other stuff well, or what if any of the limitations are.. But as always more players, the better! For those who have never heard of MESS, they basically took MAME, and started to emulate computer systems with it. All nodes are recovering except Breck and Pike both KVM nodes.  We are investigating why they have not come back online and am en route to look at them physically. The VPS management node appears to not have powered up on it’s own due to a bios setting will turn that on as soon as I get there. Earlier we had thought the power on one side dropped, but it’s apparent that both sides of power went down. We have A and B side power and UPS with the datacenter so I expect a full explanation how on earth this happened and how they’re going to prevent it in the future. Oh well, at least we are back online. Author neozeedPosted on March 8, 2013 September 14, 2017 Categories random updates1 Comment on D’oh! I guess everyone will have to deal with the questionable ads. But, heh, bills gotta get paid! Author neozeedPosted on March 6, 2013 August 30, 2013 Categories random updates4 Comments on So what the heck, I’m taking on a sponsor!